The “also receiving votes” teams will be ranked 11th-nth accordingly. This will produce a different number of teams ranked in the two poll metrics each week. 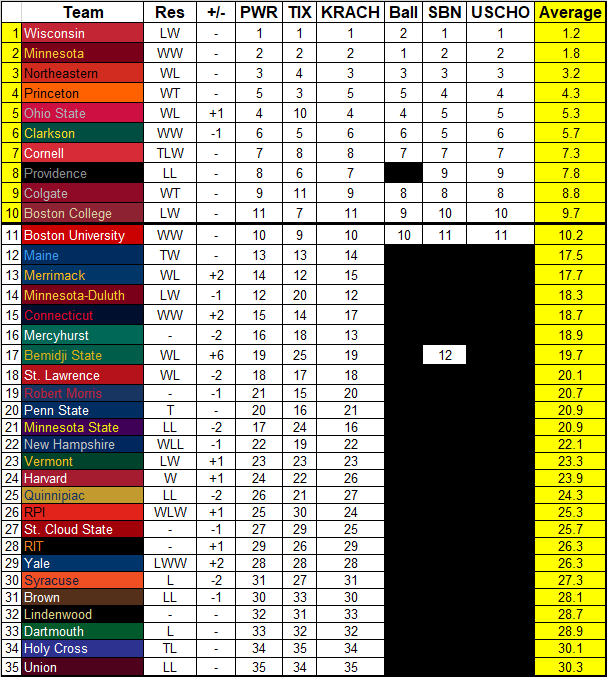 The scenario can arise where a team is graded well in the PairWise and my metric, but not ranked in any of the polls. Teams shouldn’t be punished too severely because we don’t know where they’d poll, but they should be punished somewhat for not making the top 10+ on ballots. Therefore I rank them all with the median ranking of a team that misses the ballot. If twelve teams receive votes, the median position of a team ranked between 13 and 35th would be 24th. With Victoria Bach and Rebecca Leslie departing, not much was expected of the Terriers this season. The WHEA Coaches Poll had them 6th and I thought they might miss the WHEA tournament entirely. That has not happened as sophmore Jesse Compher, and junior Sammy Davis (who didn’t play last season) have picked up the slack. The Terriers have a weak out of conference schedule having played RIT and Penn State twice and Brown once, but it’s not like they’re beating up on bad teams as this past weekend’s sweep over Providence goes to show. They’re 4-3-1 against the other three teams in the top four in Hockey East which isn’t exactly bad. They’re doing pretty much everything well, aside from their 23rd ranked penalty kill, and getting great goaltending (.935, 14 games) out of sophomore Corinne Schroeder and freshman Kate Stuart (.949, 3 games). I say this a lot, but RPI is just bonkers. They have just 25 goals in 22 games and they’re 8-10-4. 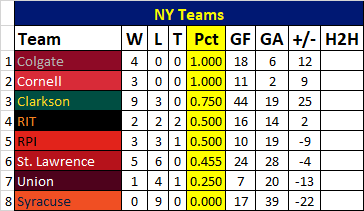 They picked up another conference win this past weekend over St. Lawrence and that actually pushed them past the Saints into 6th in the ECAC on tiebreakers. Lovisa Selander might be the best goaltender I’ve ever seen. Even though Clarkson hung 6 on the Engineers in game one of the weekend series, it would have been much, much worse were it not for Selander. RPI hasn’t played Cornell or Colgate so they’ve got a bit of a tough road ahead, but they still have both against Union and 6 of their 12 remaining conference games are against the bottom five in the ECAC. I’ve talked a lot about soccer-esque derbies and cups, so let’s see where we’re at. Probably the most uninteresting of the lot, Minnesota is running away with this one. Second place is almost more intriguing, but there’s a big gap there too. This one is a little weird because the scheduling hasn’t had Cornell or Colgate play RPI or Union or RPI play Union. St. Lawrence, amusingly, is the only team in addition to Union that has been eliminated despite being in second place. I ordered this by percentage instead of points since they don’t all play the same number of games against each other and…wow Syracuse. Wow. 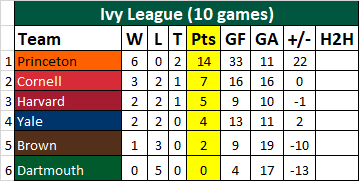 Since Princeton has gone 1-0-1 against Cornell and the Big Red decided to lose to Brown, this one is pretty much over. No change here since the CHA is still in hibernation. 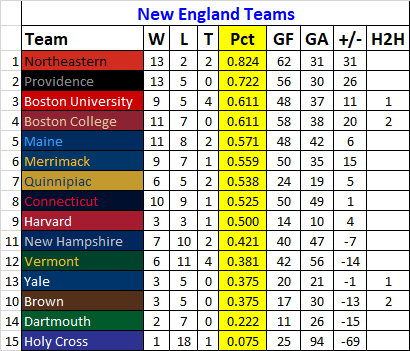 Boston College saved some face here with a win over Northeastern, but they’ve only got one game left. It’s probably up to BU or Merrimack to catch the Huskies. Fascinating. Lot of games left here but it’s Northeastern’s to lose right now. None in D-I, but feel free to watch Post at Lebanon Valley at 7 ET on Wednesday.